The Urban Partnership Program is a unique initiative of the Austrian Government and the World Bank aiming to strengthen local government capacity and to enhance cooperation among municipalities in seven South-East European countries: Albania, Macedonia, Croatia, Serbia, Montenegro, Bosnia and Herzegovina, and Kosovo. One of the key topics of this initiative concerns Municipal Finances and its relation to land and infrastructure investment management. To this purpose, local elected officials, city administrators and technical staff was presented with some practical diagnostic tools facilitating decision making processes, effective and efficient financial management toward sustainable development. Starting in December 2011, a series of City to City Dialogues (C2Cs) brought together municipal representatives and other important actors from seven different countries to discuss about issues of common interest. 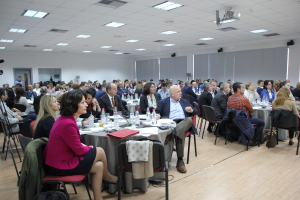 Under this initiative, Cohort I municipalities (Fier, Lushnje, Kuçove, Berat, Elbasan) were joint by other five municipalities (Permet, Himare, Sarandë, Gjirokastër, Vlorë), the Cohort II municipalities in the second phase of the project. Overall participating municipalities were engaged, on a voluntary basis, in a process of self-assessment using the Municipal Finances Self- Assessment (MFSA) methodology. Urban Audit is a methodological tool from the UPP that offers municipalities a solid ground upon which, rational decision-making regarding prioritizing projects takes place. This tool provides a framework for reducing the gap between capital investments plans, and the medium term budget planning, i.e. a model to help local governments make better decisions on urban projects, regarding their actual and future needs and their financial capacity. In this context, Co-PLAN supported five volunteering Municipalities (Fier, Lushnje, Kuçove, Berat, Elbasan) to draft their Urban Audits, and to design their priority investment programs (PIP) for the next 3 years. The process involved experts from the Urban Planning and Finance Directories of the 5 partner municipalities and was into two consecutive phases.